Saturday morning dawned bright and early. I had packed on Friday night because Kristin and her husband were coming to pick me up to start our adventure at the Space Coast Marathon. Armed with some delicious coffee, we hit the interstate and headed south. The plan was to pick up our race packets at the expo at Kennedy Space Center, and then head to a sports bar near our hotel and the course so that everyone else could watch the FSU/UF game. It was my very first visit to the space center, and it looked really interesting. It was decorated for the holidays, which was unexpected, and we had some fun posing for pictures and looking around. At the entrance to the complex was a table, where runners could secure a ticket. This would grant us access through security and then into one of the buildings. Kristin and I already had our bib numbers (we got them via the RaceJoy app), so we just had to wait on our respective lines to get our bags and bibs. The expo was packed. And very small. There was very little room to maneuver and few vendors on display. I think a lot of that had to do with the fact that this is the first time the race has ever reached capacity. It’s likely that the expo has outgrown itself and needs an overhaul for next year. We managed to make our way to the shirt pick up, got some freebies (including a super cute and versatile cinch sack from Publix) and I was able to grab a few extra salted caramel Gu packets and a car magnet. The one thing that really grabbed my attention, though, was the huge display of Big Bang Series medals. They were all so beautiful and sparkly and shiny. I can’t wait to claim all five race medals and two bonus ones for my growing collection. Upon exiting the expo area, we saw lines stretching almost to security. We stopped for one more quick picture and then headed out. Our hotel and race area was still another half hour away (which was fine for us, but was probably a little inconvenient for people coming from farther out of town), so we had to get moving if we were going to catch the game. Andrea from Once Upon A Run was waiting for us, along with some of Kristin’s friends, two of whom would be running the full marathon. We were also ravenous, and so it was great to get to the sports bar and settle in for some grub. And beer. Glorious beer. While the menu looked ridiculously good, I decided to play it safe and have a cheeseburger. I figured it wouldn’t be too rough on my tummy, and would still be a satisfying meal. It was the right decision. When the game ended, we loaded back in the car and headed to the Best Western Cocoa Inn. This was one of the host hotels, and it was four miles from the starting line, so the overall location was great. We didn’t love that it was positioned between the highway and a truck stop, but the room was fine (clean, good bed, hot water, huge TV), and the staff was lovely (for the two times we had to go to the front desk). Since we were in the race, we had a complimentary late check out of 2PM on Sunday, so that we would have time to return to the room and shower before the drive home. I thought that was very generous. and outfits for Sunday morning. Kristin suggested we drive into town to find where the start line and parking would be. We piled into the car, and navigated our way to both. The little downtown area was adorable, with narrow streets, cute shops and restaurants, and a beautiful park which would be set up for the finish, all along the gorgeous Indian River. We located where we would need to be and made call ahead reservations at the local Carrabbas for our big pre-race meal. It was a really nice dinner (except for the part where Mr PugRunner called me to ask me where the car keys were, because he had managed to lock himself out of the car with little man and they were stuck) and we dined on salads and Mezzaluna and warm bread. I wasn’t ravenously hungry, but I did try to eat as much as felt comfortable so I would be in good shape in the morning. I also kept drinking water to keep hydrated. We made it back to the hotel around 8 and Andrea and I got ready for bed. We watched some football, chatted and tried to relax. It took me a while to fall asleep. My stomach was a little upset (not sick, just nervous), and it was starting to click that in the morning, I would be running 13.1 miles for the first time. I triple checked to make sure the alarm was set (4:00 for me so I could take a quick shower), and finally dozed off. I would say I got about four or five hours of sleep, but it was just enough. Stay tuned for the recap of my very first half marathon. I’m anxiously awaiting the race report! I’m working on it. I’ve had a hard time finding my motivation the last few days, but it’s coming. Looks like fun! Can’t wait to hear about your race experience! The medals are the main reason I registered LOL! 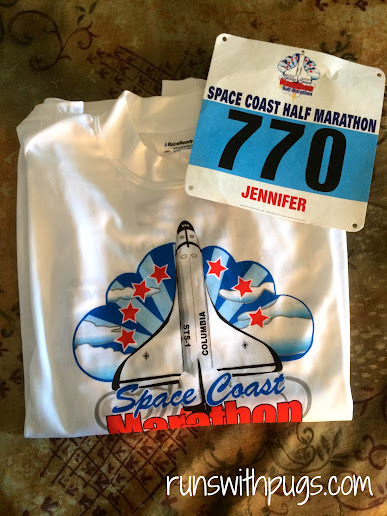 Kristin @ A Mom on the Run recently posted…I am a Marathoner! Before I read this post, I got your email!!!! Once I have time to respond I will!! 🙂 🙂 I’ve been swamped at work and keep forgetting to answer you!! Yep! My very first!!! It’s been so long coming! 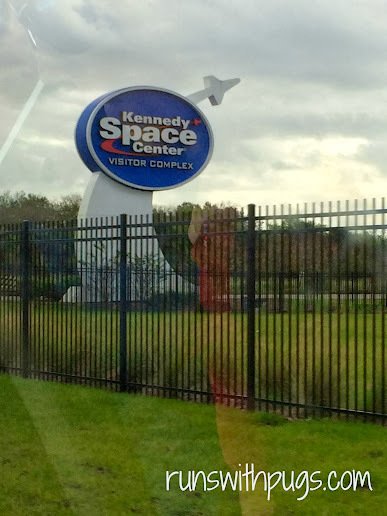 My family used to have annual passes to Kennedy Space Center and it was my absolute favorite! When I was 11 I wanted to work at mission control so badly haha! I always thought the Space Coast races had the coolest medals! Can’t wait for your recap! That is really cool. Mr PR took little man to a couple of launches/launch attempts but I had other things going on. It’s a really neat place, from what I could see. I’m getting excited to read more… eek! Hey there roomie! Ya know, I have a picture just like your second picture (a little farther out) but I had no clue it was an ornament until I saw yours!! Doh! LOL! I thought it was really cute that they decorated for the holidays! I didn’t expect that!